Fiesta-Si.com • View topic - Middlesbrough - Eurodrift 2nd Round - 21st April! Middlesbrough - Eurodrift 2nd Round - 21st April! 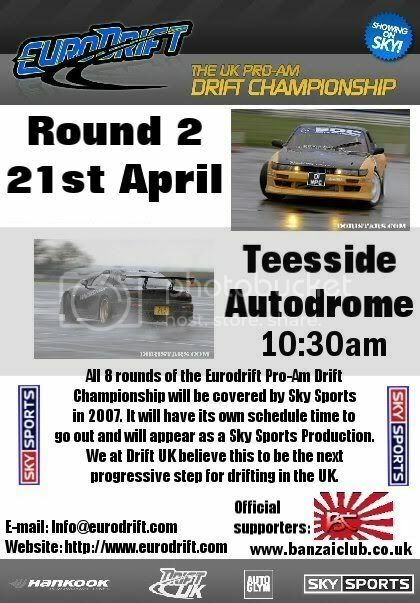 Post subject: Middlesbrough - Eurodrift 2nd Round - 21st April! Teesside Autodrome - Middlesbrough - Eurodrift 2nd Round - 21st April! "BanzaiClub are proud to be supporting the EuroDrift pro-am Championship in association with Drift UK and Eurodrift. We would be very proud to have you join us at the Teesside Autodrome in Middlesbrough on the 21st April 2007 at 10:30am until late. There are a full range of Facilities at Teesside Autodrome including a cafe, and a Bar for those not designated to drive that day. You will also have the unique opportunity for Autograph and Photo sessions with the EuroDrift Drivers, perfect for our younger enthusiasts for making them the envy of all their school friends. Especially as all rounds will be shown on Sky Sports on a weekly basis (you could be famous! ), so if your unable to make any events, be sure to tune into Sky Sports to check out this great form of Motorsport entertainment. Passenger rides are also offered from 6-7pm for the bargain price of Ãƒâ€šÃ‚Â£10 before the main event itself (subject to availability). We certainly believe this event should not be missed and this promises to be the first of many spectacular days out. Please add your name below if you would like to attend and make this a great day out with your fellow club members. http://www.stickmeup.co.uk - Stickmeup Custom Graphics!